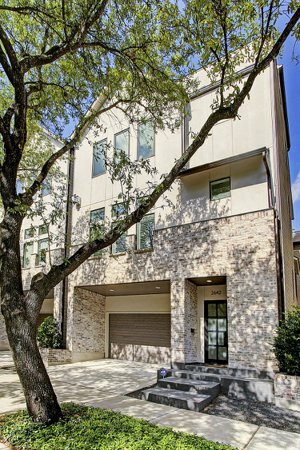 2642 Peckham Street is a beautiful four story free standing contemporary home located in Upper Kirby! Features include a gourmet kitchen with stainless steel appliances and marble counters, high ceilings, crown moldings, hardwoods, an elevator shaft, custom wrought iron for staircase, a first floor bedroom and bathroom and more, as well as a spacious roof deck with picturesque city views. Great location in Upper Kirby. Hardwoods throughout all bedrooms and hallways. Crown moldings, custom wrought iron on the staircase. Spacing for an elevator shaft. First floor bedroom with full en suite bath. Second floor open living area. Gourmet kitchen with custom cabinets, stainless appliances, marble counters and breakfast bar. Dining room with dry bar with custom wine racks and wine refrigertor, natural lighting. Spacious main living area with high ceilings, large windows. Third floor master bedroom with high tray ceilings and two walk-in closets. Spa-style master bath with double sinks, soaking tub, and separate shower. Fourth floor deck with a great view of the city. Zoned to Poe Elementary School, Lanier Middle School, and Lamar High School. Please check availability.